So I've finally set up my Race Capture device and my sensors up in the car, and now I've tested that the live telemetry broadcasting works. This Saturday 8:00am to 5:00pm (during sessions) I'll be broadcasting from Wild Horse Pass East Track. My car is number 986, device is RC_brucetudor. You can see my progress on the track live with all my engine parameters. Last edited by AZ986S; 01-09-2018 at 07:00 PM. Very cool! I will be at the track that day (Roebling) but I will check it out at the hotel that evening. I am most interested in your various oil pressure readings at the different points to see how they compare. Enjoy Roebling! I wonder if you can still see the entire session data on Podium when it is not live. I thought you had the Race Capture Track device? How is that going? Do you like the device/app? Last edited by AZ986S; 01-10-2018 at 08:57 AM. The only thing I haven't figured out is that graphic that shows several gauges and stuff - for me it has always been a static image - maybe when viewing a live stream it shows some activity? Yes I have the RaceCapture/Track and I have been liking it so far. A friend lent me a Solo DL so I am going to use that this weekend, and also I will be reviewing the Apex Pro device so it should be a busy weekend, I may not get a chance to run the RaceCapture until Sunday afternoon after I turn in the Apex Pro. I just checked. It's awesome! Pick lap 38 for example: look at how the oil pressure a the pump drops occasionally (and the accusump opens up), and then look at how little the oil pressure at the head is affected. The Accusump activated 3 times. Yo can see this clearly on the Accus_On graph when it pegs 5,000 (5 volts). The other thing I notice is how much of a pressure drop there is across the oil filter, oil cooler and rest of the engine, about 30-35 psi under load. Also, the average oil pressure drops from the the first laps to the last laps of the day. Makes sense since the ambient air temp is increasing. It was about 50F on the first session then 75F on the last one. Once I figure out how to export the log files from my phone, I'll crunch the data in Excel to see what the "lag" is between the Accusump activation and the oil pressure increase at the head (valve cover). Last edited by AZ986S; 01-13-2018 at 08:20 PM. Very cool! Thanks for the updated link. Regarding the oil pressure drop across the filter, I wonder if this is a limitation of the 1042 NapaGold filter I am using. It has a flow of 9-11 GPM @ 20 microns or so. I would think that the LN Engineering billet filter would flow much more, but at the expense of coarser filtration... 60 microns I believe. Is that a problem for the engine longevity? BTW I'm at AMP tomorrow so my data should show up on Podium again. Last edited by AZ986S; 01-19-2018 at 07:37 PM. Finally got to datalog track time oil pressure and accusump data over the weekend at Bondurant. This was my first time at Wild Horse Pass on the Bondurant loop. Pro-Autosport was using the Main track, so the Carousel was closed off and the track was only about a 1 mile long very technical short track with some elevation changes. I'm still going through the data and analyzing it, looking at how effective the Accusump system I have in my car is at reducing oil starvation issues in the M96 3.2 engine. I should have a video rendered up here soon, as well as a spreadsheet with some graphs to illustrate how quickly the oil pressure is restored following a dip (lag time). Specifically, I'll be crunching the data to see exactly how long it takes from the time the oil pressure dip is detected (accusump pressure switch post oil filter) to the time the oil pressure at the standard location (valve cover) is restored to pre-dip values. It's looking like anywhere from 120 to 500 milliseconds so far. My goal is to share empirical data so that people can make up their own minds as to how effective (or not) it is. 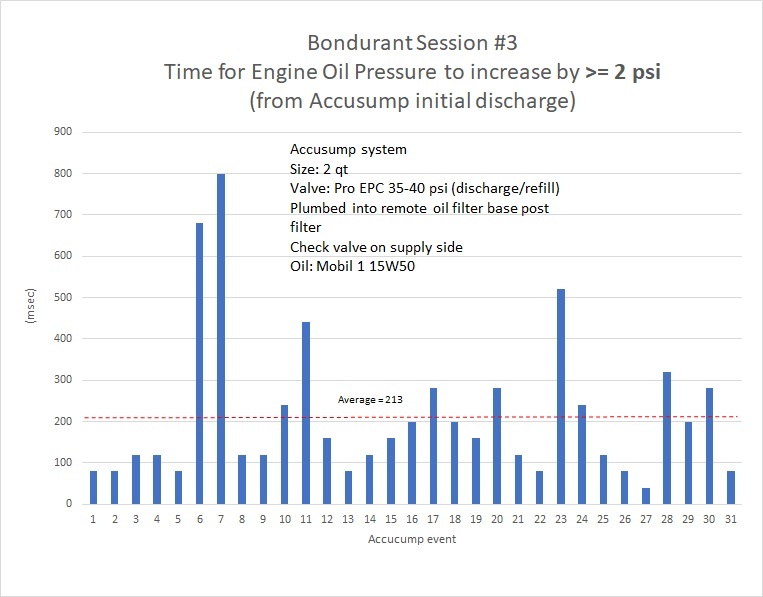 Here's the YouTube video for Session #3 with Accusump and Oil pressure data overlay. The Accusump does not activate until about the 7 minute mark, then, as the engine oil gets hotter, it activates more frequently. Very cool video, that graphically answers a lot of questions I have seen folks ask about an accusump and how it works. Also like you said, interesting the pressure differences between the oil pressure measured down at the oil pump vs measured in the valve cover way at the end of the oil path. And here are a couple graphs. The first graph shows the distribution of the time it takes from Valve Open (discharge) to Valve Close (refill). The avererage time is 822 msec. The second and third graphs show how much time it takes for engine oil pressure to increase by >=2 psi (average 213 msec) and >=5 psi (average 518 msec) from the time the valve opens. On some Accusump events, the valve closes before there is even a 5 psi increase in oil pressure. 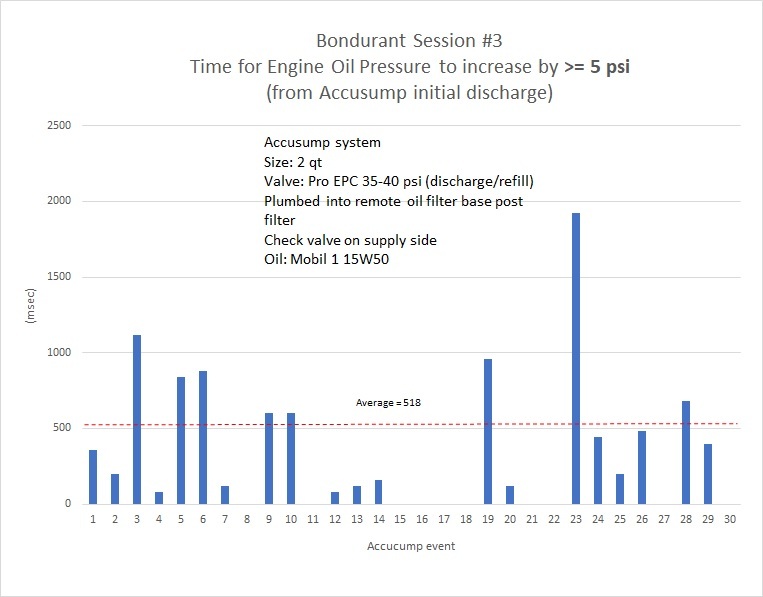 One thing to note is that it is difficult to separate the effect of the Accusump from the effect of the RPM fluctuations during the time the Accusump triggers, but since this is a fairly short event, it is assumed the oil pressure increase is due to the Accusump. What I mean is that with higher RPMs, oil pressure increases ever so slightly. Obviously, this data combines a lot of different conditions, and is specific for this track, my car, my setup, my driving technique, the oil used etc... but in general, the oil temperature gets hotter as the session goes on, and the Accusump triggers much more frequently on the second half of the session. Also, since we were running CCW on this track, there were more left turns than right. I did not notice any significant pressure dips/accusump triggers during hard braking prior to entering a left turn. This may not be true for a right turn though... Driver smoothness of input seems to minimize the accusump triggers, and the opposite seems true: quick, jerking steering inputs seem to increase the accusump triggers. So it'll be off to COTA in 9 days (Feb 23rd) with MVP TrackTime (yes it's a 950 mile drive ). I'll be data logging this fast, long track and hope to be able to report progress. Last edited by AZ986S; 02-13-2018 at 06:15 PM. 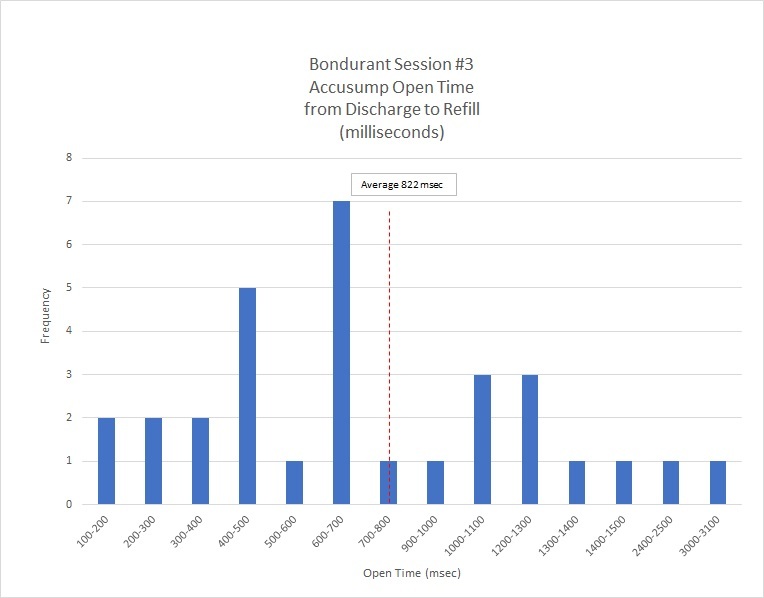 Here's the updated YouTube video for Session #3 with Accusump and Oil pressure data overlay. I added the Oil pressure at the pump (pre-filter) to have a better graphical representation of the magnitude of the oil pressure drop spikes and how the Accusump helps to smooth out the resulting oil pressure at the valve cover location.